You know those days where it’s so hot that everyone is cranky? You need to cool everyone down, both literally and figuratively? We have a few of those days every summer. Our solution? 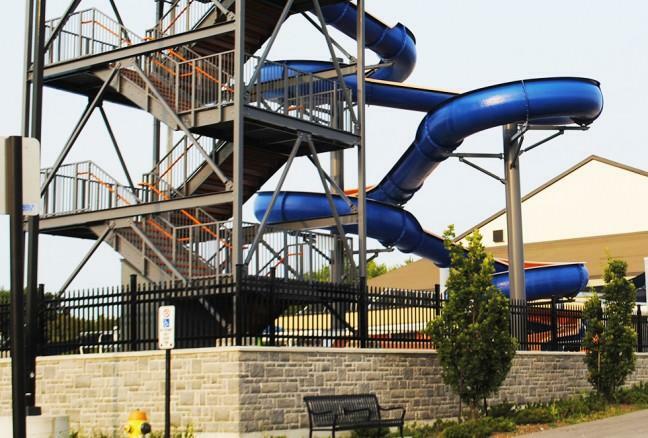 We hit one of Kingston’s many water parks. View of the waterslide from the outside. 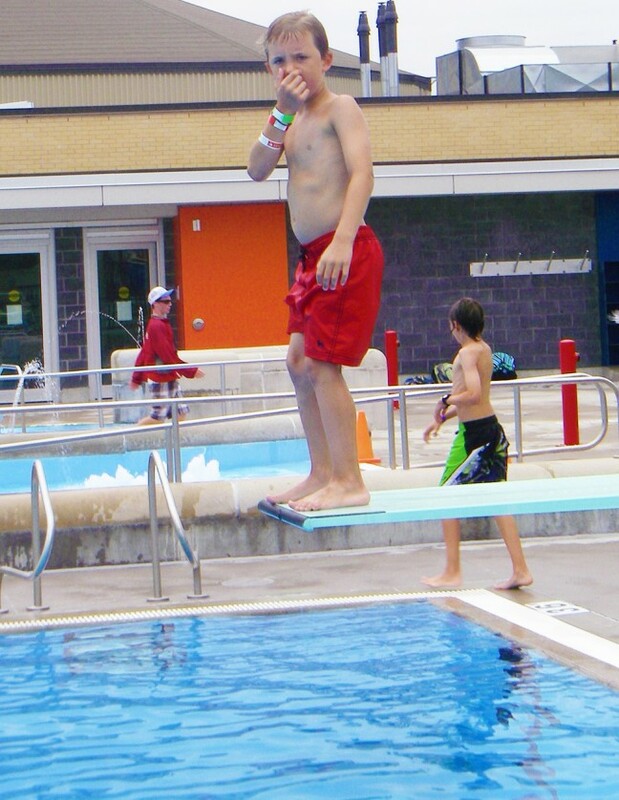 Operated by the city of Kingston, SCOTT Aquapark is our biggest water park. Featuring a 10m waterslide, 25m pool, toddler pool and lazy river, it is a paradise to all. Well almost. There are some pretty tight rules to be followed. And a staff of young folks not afraid to stand behind those rules. Even to a wet mom in a tankini with a crying child who failed the swim test. For $9.75 the three of us enter the pool and head over to the swim test area. My six year old (Iain) passes, and my eight year old (Fintan), well he doesn’t. Iain has to stay within arm’s reach of me, regardless of his pass (kids six and under must stay within arm’s reach of a parent). Fintan has to wear a lifejacket. AND stay with me, as he “failed”. When the tears of injustice are over (he can’t redo it; one of the rules in one test per day) he dons a lifejacket and we head over to the lazy river. Another rule: there’s a ratio of 1:1 (parent and kid in lifejacket) thankfully one passed! After some floating down the river, Iain wants to jump off the board. This can be done, as long as I am in the water (arm’s reach?). He jumps over and over again. I snap a picture of this great feat, and am quickly told that cameras are not allowed. Another rule. I get it though, all the rules make sense, makes for a safe place! The jump before my camera is “confiscated”. Neither of them can go down the slide, as the minimum height is 4.5 feet, which they’ve both missed by at least 6”. Eventually, we pack up and head out. There’s a great little playground and free splash pad outside of the building, we visit briefly. Despite all of the rules, I get an enthusiastic “YES” when I ask if they enjoyed the park, and they can’t wait to go again. And my eight year old? He wants to practice the swim test before we go again. 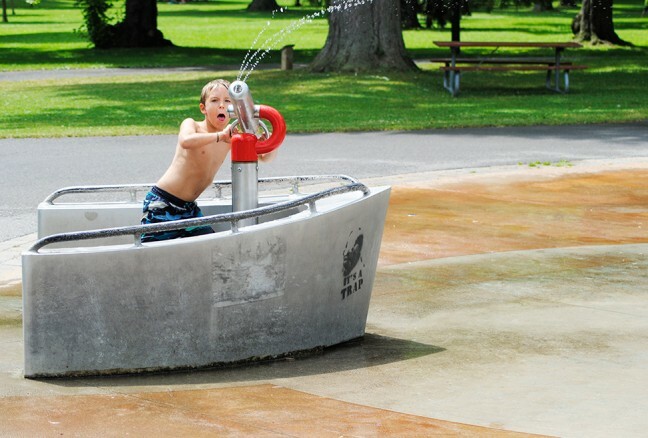 The splash pad outside of SCOTT Aquapark. 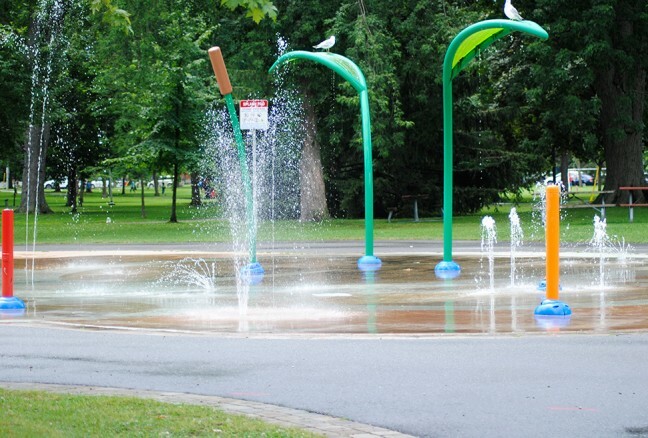 Also operated by the city, Lake Ontario Park has recently received a big makeover. 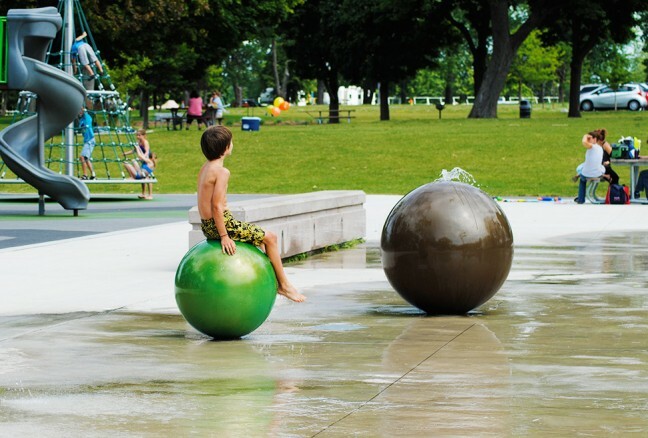 A wonderful green space where you could spend the day walking along the water, visiting the cobble beach, picnicking under trees, or the pavilion, and watching the kids frolic in the splash pad and play structure all while enjoying a great view of Lake Ontario. 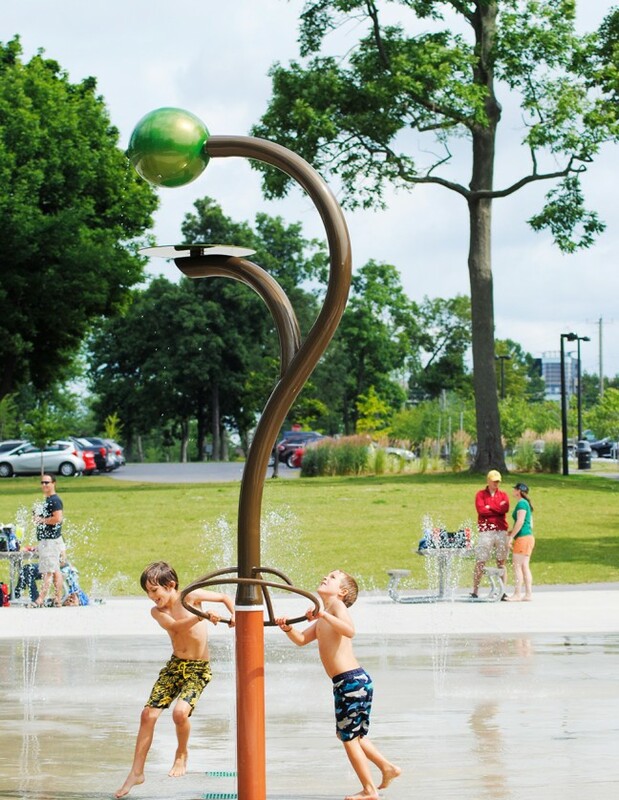 The splash pad itself seems to be a work of art, and although has only a few features, the kids have a great time splashing around. 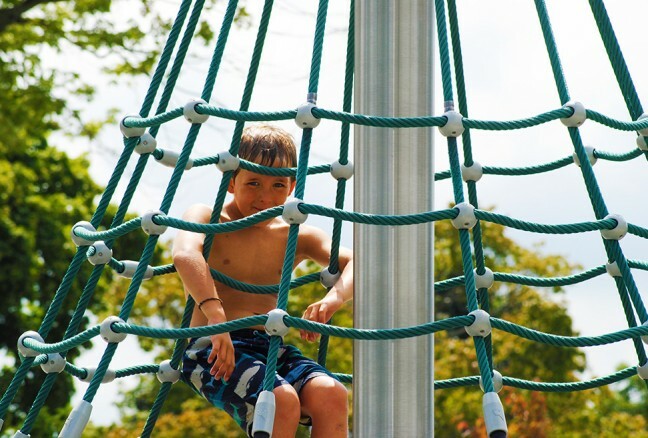 The playground alongside the pad gave lots of climbing and spinning opportunities, and the soft rubber ground made for no skinned knees. This park is less hands on than SCOTT Aquapark, leaving us Moms time to visit. Fintan taking a rest. Waterparking is fatiguing! The green ball on top is actually a bucket that randomly dumps water on an unsuspecting head. Kids can climb atop the merry-go-round to dry off in the sun before getting soaked again. We’ve been visiting this little gem in City Park since 2009, when the boys were two & four. 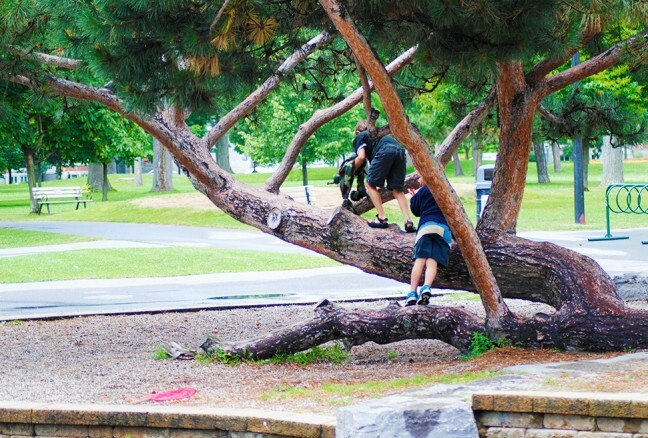 Maybe they’ve outgrown it some, but my six year old still found the child within to play while his eight year old brother chased squirrels and climbed the coolest tree in Kingston. 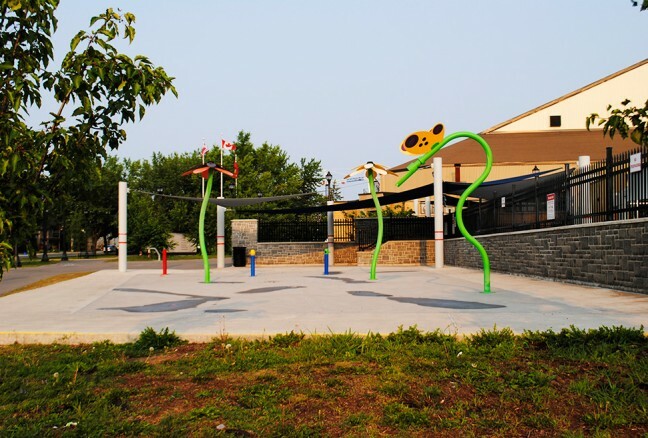 The park is walking distance from city hall, making it very accessible. There are a couple of playgrounds, washrooms and plenty of trees for shade. It’s a great park for toddlers! 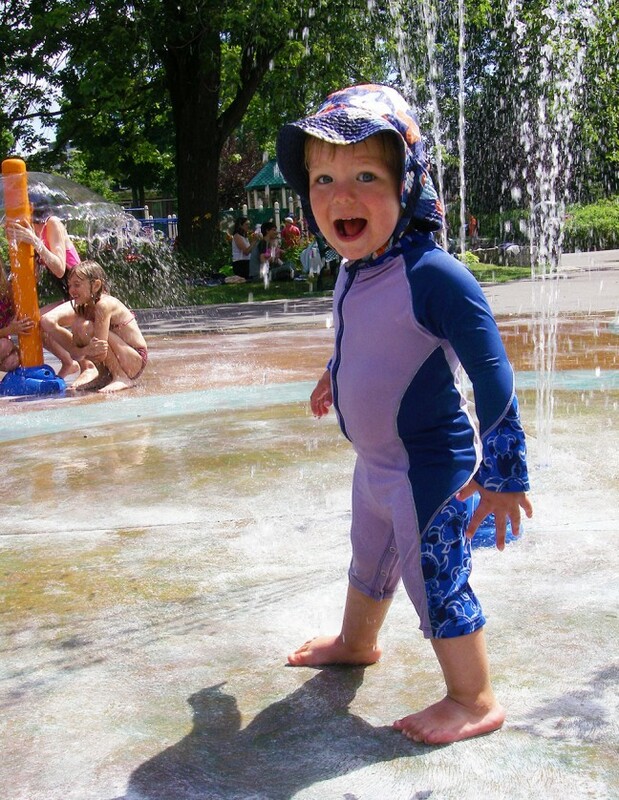 Iain’s first visit to the splash pad in 2009 – it’s still a lot of fun, five years later. Anyone within reach of the park’s water gun is fair game! And, after a day of waterparking, you can always dry off and do some good old fashioned tree-climbing. 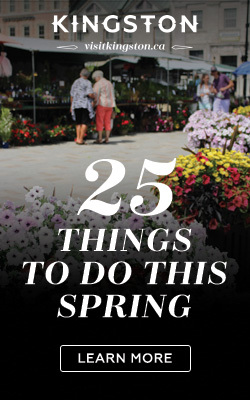 Get your monthly guide to Kingston's events, attractions and news. David Hurley & Charly Chiarelli. Jazz melodies you know & songs from Sicily!